The wounds of the world feel especially exposed this year. I’m sure this can be truly said about many times, but the sense of exhaustion with violence and turmoil, and of deep longing for genuine peace, seems especially palpable these days. Nonna Verna Harrison confesses in the introduction of Suffering and Evil in Early Christian Thought that, “questions about God, suffering, and evil arise from a heart full of anguish. They tear at our faith in an age when faith seems weak anyway” (p.x). In the face of things like the mystery of pain and evil, one reasonable response is to turn to the past in order to see what wisdom can be gleaned from the early Christian tradition about how to think about these questions (p.x). Therefore, the essays in Suffering and Evil in Early Christian Thought occupy themselves with explorations of how various figures from the Patristic period grappled with the problem of God, suffering, and evil. Theologians from both the early Christian West and East are included in the book’s pages. Hence, Irenaeus, Augustine, John Chrysostom, and Cyril of Alexandria all receive extended engagement from the volume’s contributors, which include the likes of John Behr, Gary A. Anderson, and Kallistos Ware. In “An Overview of Patristic Theodicies,” Paul L. Gavrilyuk explains to readers that Patristic thinkers never quite reached the level of “dogmatic precision” on theodicy that they did on other parts of Christian doctrine like Trinitarian belief (p.3). Nevertheless, they did share a large amount of common ground, especially in response to rival accounts of God and evil offered by other groups like the Manicheans and various gnostic teachers. Gavrilyuk argues that, broadly speaking, Christians of the Patristic era agreed that God wasn’t the author of evil, and they also rejected strong ontological dualism (pp.3-6). The narrative framework of salvation history in the Bible also helped believers cultivate hope and make sense of “the origin, spread, and ultimate destruction of evil” (p.6). While there are a number of directions that the rest of this review could go in, I want to point out a few themes brought up in this volume’s essays that I think make genuine contributions to the ongoing conversation. Douglas Finn’s essay on John Chrysostom’s treatment of Job and his suffering, for example, sheds light on the tension that some Church Fathers felt about the place of grief in the Christian life. He does this by contrasting Chrysostom’s approach to Job with Gregory of Nyssa’s presentation of his sister Macrina in Life of Saint Macrina. Finn writes that for Gregory of Nyssa (and many others), the ideal philosophical Christian life is one in which virtue is pursued, and reason rules over the lower passions coming from the more non-rational parts of the soul (p.104). Therefore, when recounting the death of his brother, Naucratius, Gregory highlights the differing reactions of Macrina and Emmelia (his mother). Emmelia gave into passion and “nature won out even over her,” causing her to lose her composure and faint (p.104). Macrina, on the other hand, kept her composure throughout her days of mourning. Though Macrina was emotionally moved by her brother’s death, her victory (in Gregory’s eyes) was that she kept her emotions in check and made no display of tears (pp.104-105). Summarizing Gregory’s approach to grief, Finn writes, “Philosophy for Gregory of Nyssa, as manifest in his Life of Saint Macrina, makes no room for grief, a disordered passion. Hence we see an explicit condemnation of such visible displays of grief as rending one’s garment” (p.106). It seems that regards to this passage at least, Chrysostom’s voice rings more truly than Gregory’s, especially when one looks at the raw and emotionally rich language found in passages like the psalms of lament. Nothing is held back from God in them, and they certainly seem to give space for the public articulation of grief and pain. In one of the book’s earlier chapters, J. Warren Smith explains that suffering was commonly understood as “degenerative change” in late antiquity (p.198). According to Ware, it was to a large extent a word that described something that was endured passively due to being outside of one’s control. When pathos is understood in this singularly passive sense, it becomes clear why theologians of the Patristic period insisted on the impassibility of God; they cared about protecting His transcendence. When understood to be a strictly passive term, Ware agrees that “God cannot be passible, for he cannot be controlled by something outside of himself” (p.216). 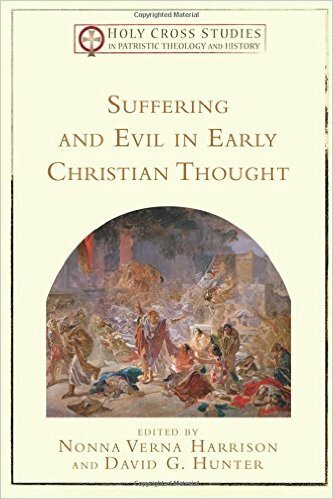 The essays in Suffering and Evil in Early Christian Thought demonstrate that there is much to be gained by spending time with writers of the Patristic era and probing into the mystery of pain and suffering in the world alongside them. They rightfully highlight the centrality of Christ’s incarnation, death, and resurrection for finding hope. For me, this Christocentric focus was one of the more significant themes to emerge from this volume, constituting a reminder that one of the foundational confessions of Christianity in the face of evil is that Jesus—as truly God and truly Man—suffered in the flesh and rose again, thereby rendering death an ultimately defeated foe. While a few of the essays took some real effort to work through, and there are to be sure aspects of Patristic thought on suffering that cannot be accepted uncritically, this a book that helps make these early Christian voices more accessible to contemporary readers, and it will hopefully lead some to also dig more deeply into the Patristic texts themselves. This entry was posted in Book Reviews and tagged Book Reviews, Cyril of Alexandria, Douglas Finn, Evil, Gregory of Nyssa, J. Warren Smith, John Chrysostom, Kallistos Ware, Nonna Verna Harrison, Patristic Church, Paul Gavrilyuk, Suffering, Theodicy, theology by joecrow91. Bookmark the permalink.